from completed build Deep Learning and Gaming Machine. Overclocked to 4 GHz. Initial benchmarks have been amazing. This is a really fast drive. Faster than my Samsung EVO 960. Edit: I knocked this drive down a star. I've struggled to get this drive working in Ubuntu 18.04 (Freezes system when trying to access). After searching the Western Digital and Ubuntu forums, it doesn't look like this drive works well with Ubuntu right now. Not sure if it's drivers or bios or something else. If anyone has luck getting this to run in Ubuntu 18.04, let me know. Still works great on Windows 10. Pretty darn fast. Reasonably priced. This is a real deal i got for $90 awhile back. It is super fast in both reads and write speeds. Great for the price over samsung evo and pro. Holds bits, holds 'em fast from what I can tell. Very fast boot with that small M.2 love it! Actually paid attention when ordering this drive (see my Crucial M.2 drive to see why that's important). 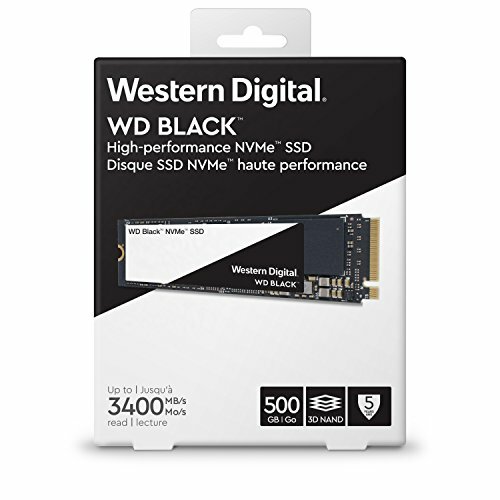 500GB NVMe SSD for a grand total of $115 after a random coupon added at checkout (thanks, Amazon!)... I can't complain at all. Fast, brought my storage to 3.5ish TB. I think I'm done looking at storage solutions for a little while.